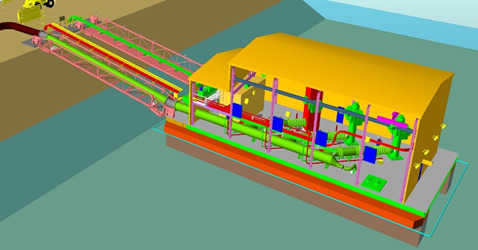 Oil Sands Thin Fine Tails (TFT) Reclaim Water Barge project included design of three (3) 1250 hp vertical turbine, 4160-volt pumps enclosed on a barge (floating pump house). Scope included 42” diameter flexible pipeline to shore and connections to electrical and controls infrastructure. To construct the barge system, including architectural aspects of the building, detailed engineering and design included: process; structural; instrumentation and controls; piping; mechanical; HVAC; and electrical. 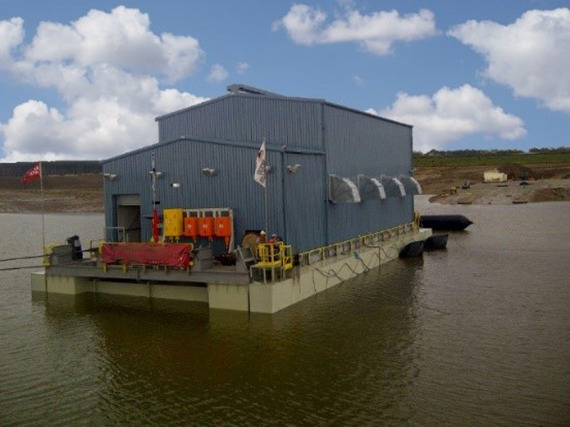 Additional coordination was required with: pump intake specialist; rotating equipment specialist; stress specialists; and a marine engineering specialist responsible for the design of the hull, pontoons and overall stability of the barge. Minimizing the weight of each component including structural steel members was a key design consideration. Project designed for extreme northern winter cold conditions and work completed in accordance with accepted standards and practices within the oil sands industry. Rally provided: project planning; scheduling; engineering drawing packages; procurement planning; specification and material requisitions for equipment and materials (vendor design and drawing reviews); and field support for fabrication, assembly, installation and commissioning of the barge. Quality assurance / control for engineering / design documents.